Concerned that my messy painting area was suddenly clean, I went in search of the culprit. Armed with my trusty Minecraft sword ("It's dangerous to go alone. Take this! "), I followed the trail to a brand new miniature painting desk! Such a wonderful surprise, I'm one lucky lady! I've been painting so much over the last few days. This month marks my seventh month of consistent painting. While I've been painting intermittently for a few years, finding time for my hobby has been a struggle. Seven months of painting & blogging may not sound like much, but for me, it's a significant accomplishment! 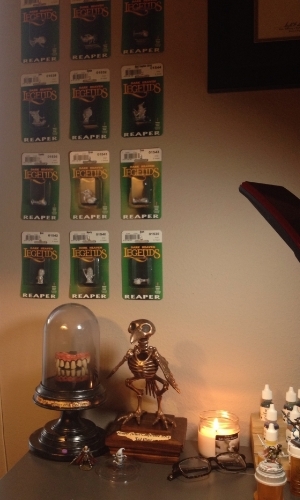 At the Reaper Artist Conference, I picked up a few (okay, a lot) of the special edition Bonesylvanian miniatures they had available only in the month of October. These chibi-style monster minis are too darn cute! Sculpted by Bob Ridolfi and Julie Guthrie, they feature big eyes and tiny little bodies. I love painting Gus so much, I had to buy the whole set! They're being proudly displayed on my wall by my desk until I can paint them. I primed Tish, the female vampire, last night and I'll be painting her next. Part of me wants to hoard them as collector's items (it's silly, I know), but they're just too cute not to paint! Using my knowledge from Derek Schubert's Painting Monochrome class I took at RAC, I tackled Gus with only these colors below, using Brilliant Blue to make his eyes pop just a bit more. This ghostly mini was perfect for my experiment, and I intend to use a monochrome palette in the future on larger scale, more detailed miniatures.